Make the mechanism that put the movies on the big screen. This project first appeared in MAKE Volume 38, on pages 82–83. Controversy swirls about who most deserves credit for inventing motion pictures. Thomas Edison, Eadweard Muybridge, and Étienne-Jules Marey all have their advocates, but a pretty good case can be made that French brothers Auguste and Louis Lumière were the fathers of the modern movie. Moving picture cameras and display systems existed prior to the Lumières’ creations, but the experience we get at the local multiplex is due, in large part, to this brilliant pair. The Lumières were born in Besancon, France, in the 1860s. Their father, Antoine, was a well-known portrait painter who, seeing an opportunity in the nascent photography industry, started a photographic equipment manufacturing business. Both boys worked for their father, the younger brother Louis in a technical role and the older Auguste as a manager. The business became largest manufacturer of photographic plates in Europe. In 1894, Antoine saw a demonstration of Edison’s kinetoscope, an early motion picture player. He was impressed; not so much by the technology, but by the potential for an entirely new entertainment-based business. Excited by their father’s vision, the brothers took up the challenge of building something that would provide a better, more immersive motion picture experience than the peephole that Edison’s kinetoscope used. If moving pictures were to become popular, they believed, the image had to be projected on a large screen. Not only could many people watch (and pay for) the movie at one time, but the experience would be bigger, grander, and more exciting. Besides that, the kinetoscope was a gigantic piece of equipment, heavy, bulky, and breathtakingly expensive. They moved forward with astounding speed, designing and patenting their device in 1895. Unlike Edison’s heavy and expensive machine, the Lumières’ cinématographe was compact and lightweight, weighing a mere 16 pounds. It used a simple hand-cranked mechanism instead of the kinetoscope’s heavy, noisy, and expensive DC electric motor. But certainly the most important advance was that their machine was a bona-fide projector, able to throw a moving image onto a large screen, making it possible for a group of people to watch a movie at the same time. In March 1895, the brothers screened a short film called La Sortie de l’Usine Lumière a Lyon for a Parisian audience. The 47-second long movie is a bit short on plot and character development — it consists mainly of female workers walking out of the gates of the Lumière factory in Lyon, France. The highlight is when a man almost rides a bicycle but then doesn’t. The Godfather it isn’t, but in terms of movie technology, it was a world changer. The cinematograph did a lot of things much better than did the praxinoscope, the kinetoscope, the mutoscope, or any other of the motion picture machines that preceded it. The patent drawings detail, among other innovations, its most important technological advance: the incorporation of a sophisticated mechanism called an eccentric cam to position a single frame of the film stock in front of the projector lens, hold it there for one-sixteenth of a second, and then quickly advance the film to the next frame. More than a century ago, the Lumières brought the motion picture into world focus when they created the modern movie theater experience. They were the pioneers whose cam-controlled movie projector provided the means not only to tell stories but to permanently preserve and depict nearly all aspects of life. Rotary cams are among the most important mechanical mechanisms. Every car and truck has a bunch. They’re in sewing machines, weight training machines, machine tools, assembly lines, and myriad other common technologies. Their main purpose is to translate rotating motion into linear motion. To do this, a spring is often used to keep a part called a follower in sliding contact with a rotating disk called a cam. As the cam turns, the follower traces out a programmable up-and-down pattern that can used to control the speeds, accelerations, and directions of machine parts. In their movie projector, the Lumière brothers designed the cam follower to completely enclose the cam. 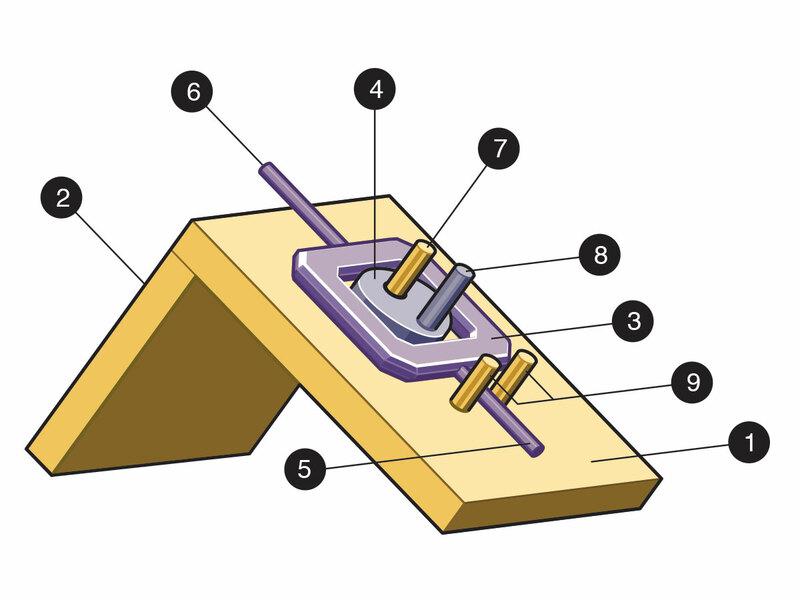 In this design, neither a spring nor gravity is necessary to maintain sliding contact; the mechanism works flawlessly in any direction or orientation. The follower is connected to claws or pins that grab the movie film by its perforations, hold it stationary in front of the lens for a one-sixteenth of a second, and then advance the film through the projector and release the perforations. This method provides a smooth, relatively simple, and above all, dependable method of moving, pausing, and advancing film. To see it in action, visit makezine.com/go/lumierecam. 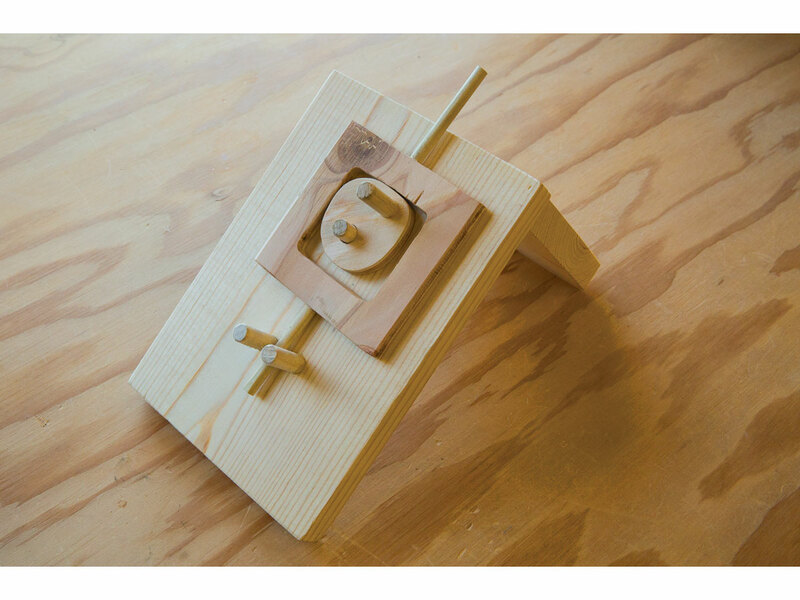 This project is fun to make, and you’ll get a really interesting desk toy out of it. When you turn the crank, the claw moves with a peculiar motion that you can adjust by making small changes in the profile of the cam with a file or saw blade. You can perform endless experiments with the shape of the cam to make the follower move in a variety of interesting ways. 1. Cut the cam follower. 2. Attach the pin and claw. 9. Turn the crank and try it out! Step #1: Cut the cam follower. Always wear safety glasses when using tools. Use a jigsaw to cut the 2"×2" square opening centered in the 3½"×3½"×3/8" follower piece. Use sandpaper to smooth the interior surfaces; they must be completely smooth and free from nicks in order for the cam to slide easily inside the follower. Step #2: Attach the pin and claw. Drill a ¼" hole ½" deep in the exact centers of the upper and lower ends of the cam follower. Add a drop of glue to each hole and insert the pin and claw dowels. Let dry. Step #3: Cut the cam. Using the diagram as a guide, use a jigsaw to cut the cam. Sand the surface completely smooth, making sure it is free from nicks or pits. Test-fit the cam inside the square hole in the cam follower — you must be able to completely rotate the cam inside the hole without any binding or interference. If binding occurs, note where the interference takes place and use sandpaper or a file to remove enough wood from the cam so it turns smoothly. Step #4: Drill the cam. Drill two 3/8" holes completely through the cam as shown, for the axle and the crank. Enlarge the axle hole to 7/16" so the cam can spin freely. Take care to avoid splintering the wood as you drill. Step #5: Make the base. Drill three 3/8" holes through the base as shown. Glue the axle and the pin guides into the holes, then glue the prop to the back of the base, centered near the top. Clamp and let dry. Step #6: Attach the crank. Place some glue in the cam’s crank hole and insert the crank, making sure it doesn't protrude out the back. Wipe up any excess glue and let dry. Step #7: Sand and paint. Carefully smooth all surfaces with sandpaper. The smoother the cam and follower surfaces, the better they work. Paint (if desired) and let dry completely. Step #8: Assemble the mechanism. Place the cam axle through the hole in the cam. Place the cam follower over the cam, making sure the pin is located between the 2 pin guides as shown. Step #9: Turn the crank and try it out! As you turn the crank clockwise, you’ll see that the top of the cam follower traces out a repeating motion where the claw rises (in the Lumière projector, this is where the claw engages the perforations in the film stock,) moves to the right (advances the film,) remains stationary (“dwells” in engineering lingo) for 1/16 second while the image is displayed, dips and returns, and then starts over. If the cam and follower seize or bind, reshape the cam to eliminate interference and apply a squirt of powdered graphite to the cam surface to make things turn more smoothly. You can attach a crayon or marker to the tip of the claw to trace out its motion on a piece of paper. If desired, you can reshape the cam to get different motions that would allow you to use different film sizes or dwell times.